Get it framed! Choose from two classic colors, Black Satin or Walnut. Your print comes pre-installed in your frame off choice. Ready to display right out of the box! Wall frames are made from high quality eco-friendly wood composite and wrapped with very smooth laminate finish. 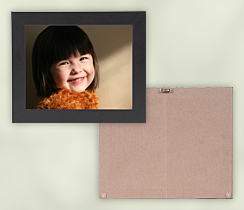 The frames are then finished with a brown paper, bumpers to protect your wall and a hanging bracket.